The Port of Los Angeles, located in San Pedro, has the lowest bike-sharing ridership numbers among the four regions across Los Angeles County, according to a Metro report. "I don't think my colleagues use it; tourists use it," said Tracy Bergener, a local resident and bartender at the San Pedro Fish Market. "I don't think this is sustainable." Since the first pilot program rolled out in downtown Los Angeles two years ago, the Metropolitan Transportation Authority has expanded the bike-sharing system to Pasadena, Venice and the Port of Los Angeles. While Metro has set a target of one ride per bike per day for each region, none of the regions have managed to achieve the company’s ridership expectation on a quarterly basis, according to data published by Metro. Metro's data show that the port recorded an average of 0.09 rides per bike per day in the fourth quarter of 2018. Not only did the performance fall far short of the goal, but it also marked the lowest ridership at the port since the launch of the program. The problem of low ridership did not happen only at the port. In the December quarter, downtown Los Angeles. had an average of 0.65 rides, while Venice had 0.47 rides. All the numbers had missed Metro's expectation. 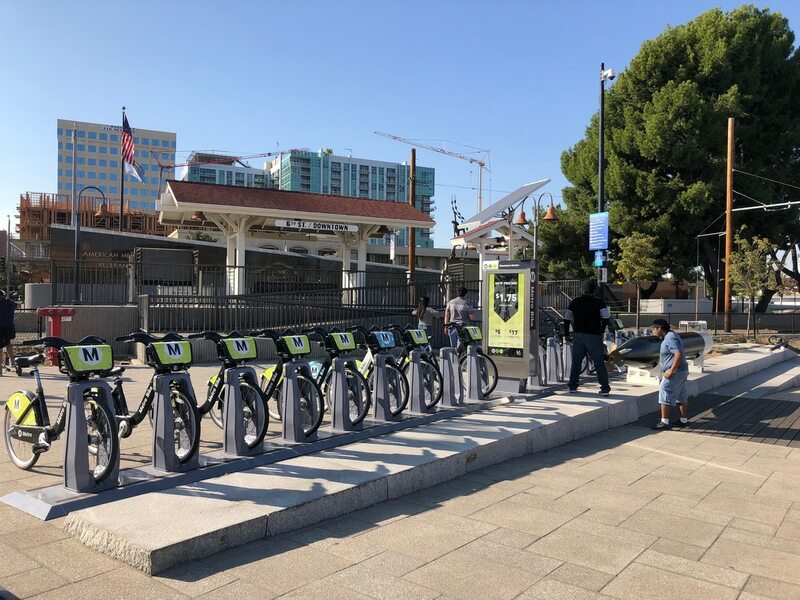 San Pedro is subsiding 65 percent of Metro Bike Share's operation and maintenance cost on the waterfront, which totals $3,800 per bike annually, said Dave Sotero, a spokesperson for Metro. According to Metro’s data, 134 bikes were operating at the port in the fourth quarter of 2018, meaning that the operation and maintenance cost of those bikes had amounted to $509,200 from October to December. While monthly passes accounted for almost two-thirds of the overall types of passes in downtown Los Angeles and Pasadena, bikes at the port and Venice are mostly appealing to walk-up riders. All four neighborhoods are struggling with low numbers for annual pass subscriptions. Bergener said the geographic location of San Pedro might be a damper on the ridership, despite seeing the program Metro Bike Share as a brilliant concept of advocating a bike-riding lifestyle for the environment. "San Pedro is hilly, it is not a great place to ride a bike," she said. Sotero said the port is an up-and-coming destination with a lot of real estate and retail development planned and was thus thought to be a good place to launch a bike-share program. But Genevieve Giuliano, director of the METRANS Transportation Center at the University of Southern California, called into question the safety of riding a bike at the area on the back of the port-related pollution and large trucks on the road. "It makes no sense," said Giuliano. "Nobody should be riding a bike at the port from a health standpoint." Giuliano said the program would be sustainable only if the Port of Los Angeles sees the values from a policy perspective. "Maybe [bike-sharing is] important as a symbol," she said. "They will just keep paying for it." To combat an underperforming ridership number, Metro has initiated a slew of promotions to invigorate the use of bike-sharing. With the TAP card integration and discounts for college and vocational students, Metro spokesperson Sotero said the bike-sharing facilities can be a viable transit option at the port. In an effort to reduce traffic congestion by providing new forms of transportation, the bike-sharing expansion plan in Los Angeles is underway. Sotero said neighborhoods including University Park, Koreatown, MacArthur Park, Echo Park, Silver Lake, Palms, Mar Vista, and Playa Del Rey are on the 2019 expansion agenda. However, Metro has forecast a budget deficit of $12.5 million for Metro Bike Share's operation for the 2019 fiscal year, the company's latest adopted budget report says. The lackluster ridership performance in downtown Los Angeles, Pasadena, the Port of Los Angeles and Venice might signal a grim future of bike-sharing development in the rest of Los Angeles. "It will take a long time," Giuliano said. "There is just not gonna be enough demand to do these things."